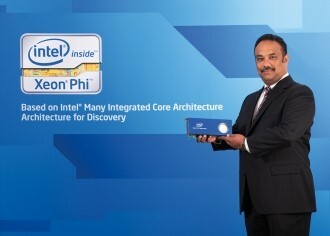 Intel announced during the International Supercomputing Conference that Intel Xeon Phi is the new brand name for all future Intel Many Integrated Core Architecture (Intel MIC Architecture) products. Codenamed Knights Corner, the first generation Xeon Phi coprocessor solutions will work alongside existing Xeon E5-2600/4600 processors to deliver new levels of performance for parallel workloads. More specifically, the Xeon Phi coprocessor uses the same 22nm 3D Tri-Gate transistor technology found on Ivy Bridge processors and will utilize the PCIe form factor. Each coprocessor contains more than 50 cores and a minimum of 8GB of GDDR5 memory. 512b wide SIMD support is said to improve performance by allowing multiple elements to be processed using a single instruction. Intel demoed a single Knights Corner coprocessor late last year at the SC11 supercomputing conference in Seattle. The chip was able to deliver over 1 teraflops, or a trillion floating point operations per second. For comparison, it took over 9,000 Intel Pentium II processors to achieve the same feat way back in 1997. The coprocessor is compatible with x86 programming models and will be used in high performance computing (HPC) environments. The solution runs its own Linux-based operating system that works independently of the host system’s operating system. Intel says that 44 manufacturers have already committed to the new architecture including Bull, Cray, Dell, HP, IBM, Inspur, SGI and NEC. Chipzilla expects Xeon Phi solutions to be available by the end of 2012.